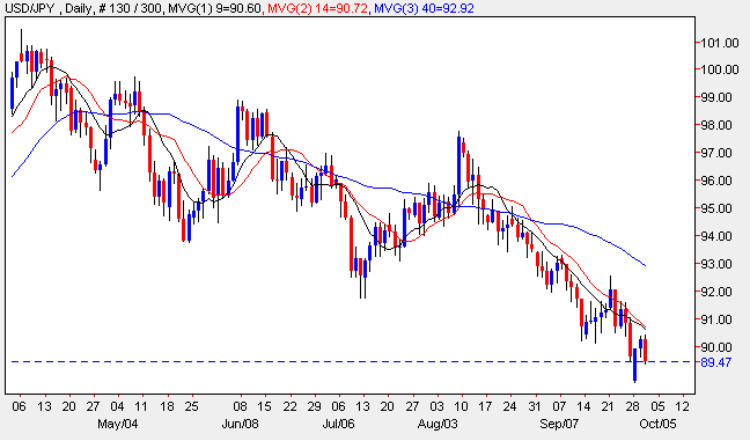 The yen to dollar continues to slide lower, but the question of course everyone is asking is ‘for how much longer?’ – in other words how long before the Bank of Japan steps into the market to prevent further strength in the Japanese yen which ultimately will hurt their export driven economy. The question is not whether they will, but when, with most currency analysts and economist suggesting that 86 will start to hit the pain threshold for the Bank of Japan, should we reach this point in the current trend. At the moment this looks increasingly likely, but we do have to penetrate the major resistance which so far has provided little in the way of a barrier to a further fall, as we are currently around half way through and approaching the lower level at 88. If we break through the floor, then this could open the way to a much deeper move which will then increase the prospect of an intervention by the BOJ once we approach the target outlined above. With all three moving averages pointing firmly lower, the bearish trend is likely to continue until this occurs.